"Canned Oxygen - Shin-Hye Park, Jean Claude Boutrouille Part of Group Show"
Icosahedron Gallery is pleased to present "Canned Oxygen," a group show focused ondiverse approaches to contemporary landscape. "Canned Oxygen's" works range from traditional landscape to urban dystopia, from Abstract Expressionist inspired paintings to visual metaphysical studies. 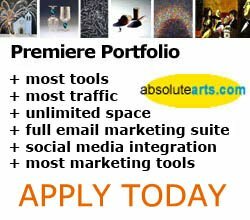 Theinternational roster of featured artists includes Shin-Hye Park and Jean Claude Boutrouill, who are Premiere Portfolio Members at absolutearts.com, as well as, Monika Degan, Stephan Degan, Flavio Carvalho, Barbara Burger, David Abse, , Susan L�th Hedegaard, Fabio Adani, Giovanni Greppi, Michinori Maru, M�lanie Lefebvre, and Vlado Tudja. Shin-Hye Park, Monika Degan, and Stephan Degan employ traditional techniques in theirlandscape paintings. Shin-Hye Park of Korea considers her minimal, tranquil seascapes more spiritual than photorealist. Park's carefully-cropped compositions communicate notions of inner peace, balance, and Zen through the fluidity of waves. Married couple Monika and Stephan Degan live and work in Houston, Texas. Before moving to Houston in 1984, Monika was raised in Switzerland. She paints detailed landscapes and seascapes in skilled watercolors. Stephan Degan studied oil painting at The Gary Hernandez School of Fine Art in Houston. Stephan's work celebrates the beauty of nature in his representational landscapes. Artists Flavio Carvalho and Barbara Burger's subjects are the city in their modern concrete landscapes. Award-winning Brazilian designer Flavio Carvalho's digital C-prints of New York's rooftop water towers portray the signature melancholy of the city. Shot while on a visit to New York, Carvalho captures the poetryof the empty expanse of sky above the buzzing city. American Barbara Burger illuminates the magic of New York in her paintings. Burger renders familiar places such as the Brooklyn Bridge with heartfelt emotion. David Abse, Jean Claude Boutrouille and Susan L�th Hedegaard's works reinterpret the physical world in colorful abstract landscapes. United Kingdom's David Abse has exhibited in the UK andinternationally since studying art and design at The University of Wolverhampton in the 1980's. Now living in the south of France, Absecites a combination of his external and internal environments asinspiration for his raw, gestural paintings. Jean Claude Boutrouille isan intellectual and lover of literature, art, music, cooking andculture. A self-taught painter from France, Boutrouille works in the modernist traditions of Abstract Expressionism, adding a touch of hisbeloved classics with intentionally cracked and aged surfaces. Susan L�th Hedegaard of Denmark embraces chaos and chance in her abstract,mixed media pieces. Working on elongated plexiglass panels, Hedegaard's work is lively and filled with drama. Exploring landscape from a metaphysical perspective is Fabio Adani, Giovanni Greppi, Michinor iMaru, and M�lanie Lefebvre. Italian Fabio Adani's cold, minimal, predominately blue landscapes redefine the boundaries of thought and reality. Adani's sparse spaces highlight the possibility that idea isreality itself. Italian-born Giovanni Greppi's breadth of international experiences, including the destruction a body of his work by guerrilla fighters in Colombia, have informed his sensitive abstract paintings. Now working in Tuscany, Greppi continually produces abstract artworkrooted in themes of idealism and compassion. Michinori Maru of Japan, breaks down physical spaces in his cubist-influenced work using hisself-coined term, "The Zune," referring to the gap between theactuality and the memory of experience. M�lanie Lefebvre, of Canada, explores a range of emotions through focus and manipulation of the horizon line. She states, "a line creates space but also divides ininto two symbiotic parts". Showing formal influence of Abstract Expressionist painter Mark Rothko, Lefebvre seeks to create a "sensitive rather than descriptive" space.